"These are some of the most important hints and tips I can offer to help you have a better time hiking. Some are discussed on other pages of the site, while others are miscellaneous items just listed here. Have a great hike!" Learn from more experienced hikers or pass on your knowledge. Drink often to stay hydrated. Carry enough water for the day and your pack will get lighter as the day wears on. Small snacks often will keep your energy level up rather than waiting for a big lunch meal after you've emptied your body's reserves. Keep a small amount of surplus food ready, just in case. Embrace Leave No Trace ethics - using the open spaces is not a right, its a privilege we need to keep available to others years from now. Leave your hike plan with someone back home and call them when you get off the trail. Bring and use sunscreen and a hat to prevent sunburn, even on cloudy or cold days. 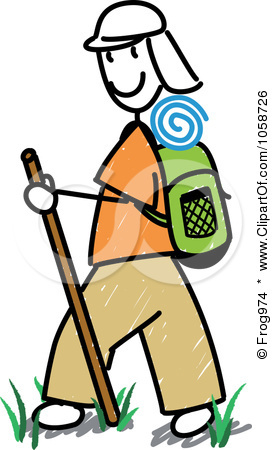 Plan a hike that is suitable for everyone in your party and let the slower person set the pace. Repackage to reduce weight. No need to take an 8 ounce bottle of insect spray if you can pour some into a 1 ounce spray bottle you can pick up at Wal-Mart. Don't bring the whole plastic-wrapped box of 12 energy bars when you'll only eat 2 and need one more just in case. Leave all your cotton clothes at home. Keep a bandanna tied to your pack strap for a quick wipe of your brow as needed. Inspect your emergency and first aid kits before each hike. Replace consumed items. Especially be able to start a fire. Water is critical for staying alive, but it is also deadly when mixed with cold on the trail. Keep yourself and your gear dry. Put items in zip-loc baggies, sleeping bag in heavyduty plastic garbage bag, clothes in waterproof bags. Carry and use raingear. If your hands swell while hiking, raise them. Hold onto your pack shoulder strap for awhile and see how that helps. Use trek poles to keep your hands elevated a bit and keep the muscles active. Take a photo ID, insurance card, and credit card on the trail. Before a long trek, taking digital photos of your documentation and emailing it to yourself can be helpful if they are lost or stolen. Easy access to a copy of the document may aid in getting replacements faster. You may see rock cairns, piles of rocks, along the trail. Don't destroy them, but don't add to them either. Don't create cairns, tree blazes, or any other sign to mark the trail - people should be able to navigate their own route and scarring the landscape doesn't help anyone. The agency with responsibility for managing the land will determine which markings are appropriate.